Samsung is just about to launch its Android based tablet, Galaxy Tab, and its features with authentic photos keep spilling out on the web. The latest photos to hit the web have a surprise which fans and experts didn’t expect. 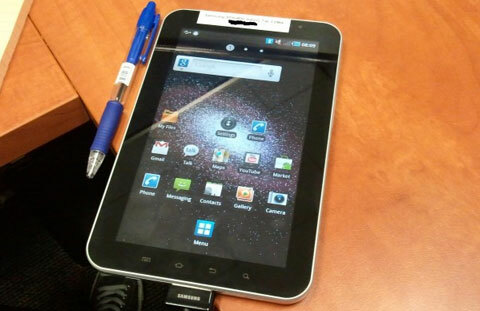 The iAndroid forum released the new photos which show the Galaxy Tab carrying a sticker on one side that clearly states CDMA. The source also praised the device for its strong speakers, call quality and, of course, the ability to run Flash. It’s not clear whether the calls would be made over 3G or WiFi but either way the quality is reported to be superb. The previewers rated the GPS on the device as a bit slow but it’s there and it works. The Galaxy Tab also has a “table charging station” on the top left with HDMI and audio output ports which make the tablet a viable choice for transferring movies into your HDTV. Samsung is offering the tablet for $ 69, with a keyboard peripheral available for $ 105 and a leather case that doubles as a stand for $ 52.